Nature saves the best and to, be shared by many. It has been estimated that there are 10,000,000,000 different kinds of genes distributed among Earth’s living organisms. However, some of these genes are responsible for controlling similar biochemical pathways among many types of organisms. Biologists say these genes are “conserved.” That is, they are similar and generally show little variation. For example, genes that control fundamental biochemical processes such as cellular respiration are strongly conserved across different kinds of organisms. The aerobic cellular respiration process carried out by the bacterium Escherichia coli is almost the same as that performed by human beings, Homo sapiens, and the maple tree, Acer saccharum. Other genes are more specialized and unique to certain species. For example, a certain strain of cholera bacteria (Vibrio cholerae) contains a unique gene allowing these bacteria to better survive as human pathogens. These genes have not been conserved across species. Species that are very common, for example, E. coli, usually have great genetic diversity. Genetic diversity within the species makes it highly likely that the species will be able to adapt and survive in ever-changing environments. Species with a great deal of genetic diversity are also more likely to continue to exist for longer periods. On the other hand, species with limited diversity do not have the same genetic resources to cope with a changing environment, and are threatened with extinction. Many organisms on the verge of extinction, for example, cheetahs (Acinonyx jubatus), are in this position. In the past, cheetahs were known to be in Asia, Europe, and Africa. However, they now exist only in a small population in sub-Saharan Africa and in an even smaller group in northern Iran. • What is the value of genetic diversity? • Why do some species have little genetic diversity? • Are extinctions that humans cause a problem? Plants, animals, and other kinds of organisms exist not only as genetic individuals but also as part of a larger, interbreeding group. An understanding of two terms—species and population—is necessary, because these are interconnected. A species consists of all the organisms potentially capable of breeding naturally among themselves and having offspring that also interbreed successfully. As of 2009, the results of a world-wide effort (Catalogue of Life) to record all species has identified over 1,160,000 species. A population is a group of organisms that are potentially capable of breeding naturally and are found in a specified area at the same time. The concept of a species accounts for individuals from different populations that interbreed successfully. Since biologists designate populations as the organisms found in a particular place at a particular time, most populations consist of only a portion of all the members of the species. For example, the dandelion population in a city park on the third Sunday in July is only a small portion of all dandelions on the planet. However, a population can also be all the members of a species—for example, the human population of the world in 2008 or all the current members of the endangered whooping cranes. Population genetics is the study of the kinds of genes within a population, their relative numbers, and how these numbers change over time. This information is used as the basis for classifying organisms and studying evolutionary change. From the standpoint of genetics, a population consists of a large number of individuals, each with its own set of alleles. However, the populations may contain many more different alleles than any one member of the species. Any one organism has a specific genotype consisting of all the genetic information that organism has in its DNA. A diploid organism has a maximum of 2 different alleles for a gene, because it has inherited an allele from each parent. In a population, however, there may be many more than 2 alleles for a specific characteristic. 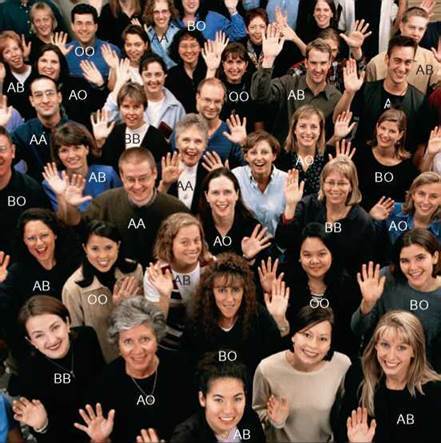 In humans, there are 3 alleles for blood type (A, B, and O) within the population, but an individual can have only up to 2 of the alleles (figure 12.1). Any individual can have only 2 alleles for a particular gene, but the population can have several alleles of that gene. Theoretically, all members of a population are able to exchange genetic material. Therefore, we can think of all the genetic information of all the individuals of the same group as a gene pool. A gene pool consists of all the alleles of all the individuals in a population. Because each organism is like a container of a particular set of these alleles, the gene pool contains much more genetic variation than does any one of the individuals. 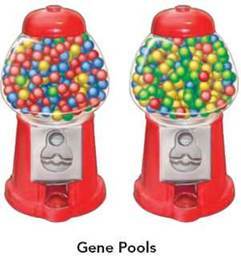 A gene pool is like a gumball machine containing red, blue, yellow, and green balls (alleles). For 25 cents and a turn of the knob, two gumballs are dispensed from the machine. Two red gumballs, a red and a blue, a yellow and a green, or any of the other possible color combination may result from any one gumball purchase. A person buying gumballs will receive no more than 2 of the 4 possible gum-ball colors and only 1 of 10 possible color combinations. Similarly, individuals can have no more than 2 of the many alleles for a given gene contained within the gene pool and only 1 of several possible combinations of alleles. 1. How do the concepts of species and genetically distinct populations differ? 2. Why is it that a population can be more genetically diverse that an individual? 3. Give an example of a gene pool containing a number of separate populations.